Over at Dynamic Duos, there's a monochromatic challenge using a couple of my favourite neutrals. I can't believe we've done our first 3 months of challenges already. 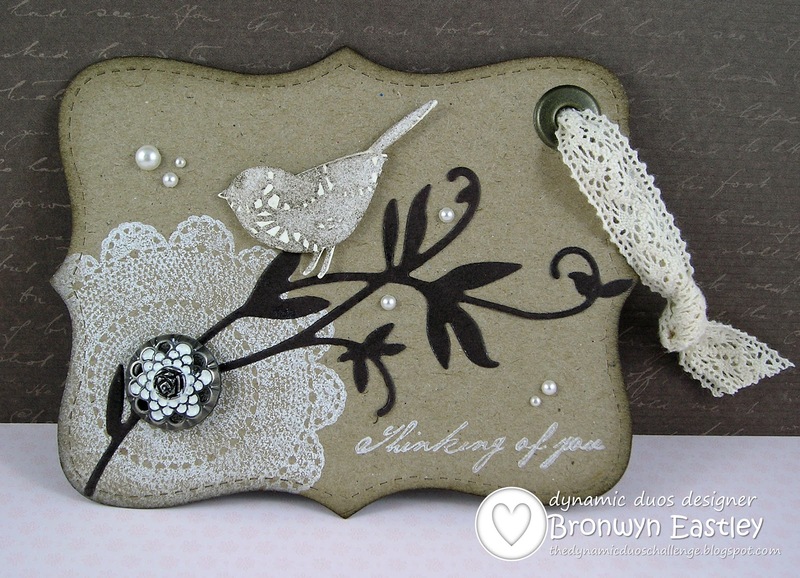 I have been showcasing quite a few tags lately and this one features a beautiful doily stamp from a Dark Room Door Set, a leafy flourish die from Marianne Creatables, The Top Note Die from SU and the cute little Perched Reed Bird die from Memory Box. The bird was cut once in Very Vanilla Card Stock and then again with a paper doily. I sponged over the doily in Early Espresso Ink so the lacy pattern stood out and then added some pearls and other accessories onto the tag to complete the project. 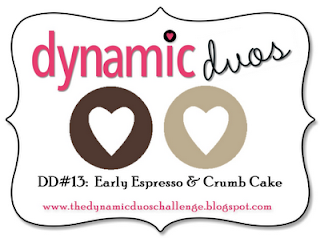 The response to the challenges at Dynamic Duos has been phenomenal and I love checking out the entries. Hope you can join in for week 13. Phew! These are the last examples (except a couple of DT stuff to go) in my 'Totally Tags' Series. I hope you have enjoyed checking out some different ways that you can use the humble tag in a variety of paper craft projects. 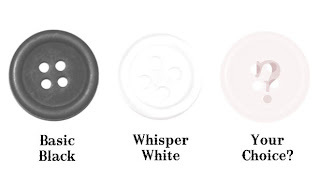 So how do you emboss fabric? Simply by adhering it to some card stock and then running it through your Big Shot using an embossing folder. 1. Get some self adhesive paper and peel off the top layer of 'film'. 2. Stick your piece of material onto the sticky side that you have just exposed. 3. Peel off the back layer and adhere your card stock. 4. 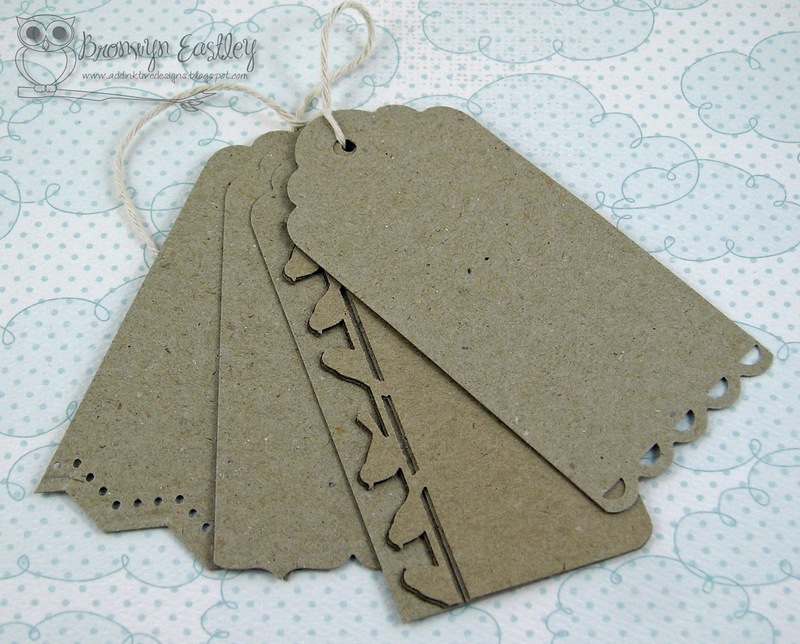 Use a die cut to cut out a tag shape (or simply use a tag for the third step and fussy cut around the tag, as I did with the following example). 5. 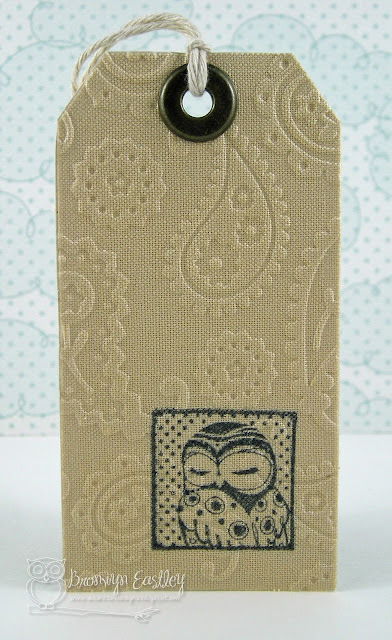 Stamp your image onto the fabric (I used Black Staz-On). 6. 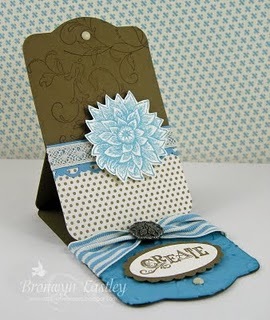 Put your tag inside an embossing folder of your choice and run it through your Big Shot machine. 7. 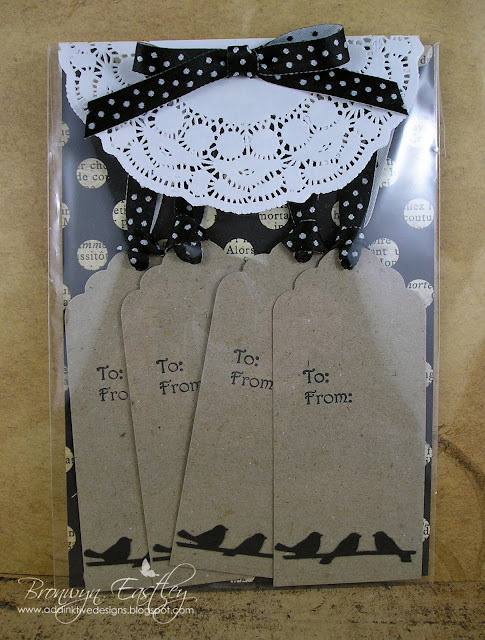 Attach a ribbon, brad, twine or eyelet to the top part of the tag. 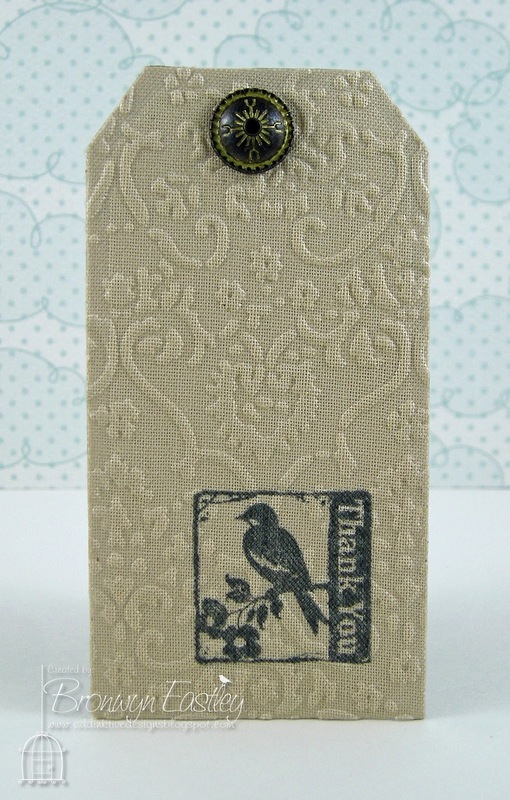 This last tag made from material didn't involve any stamping. 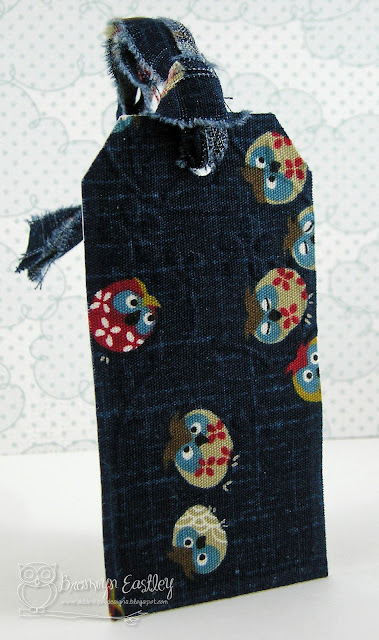 I just used some left over fabric to make the tag. 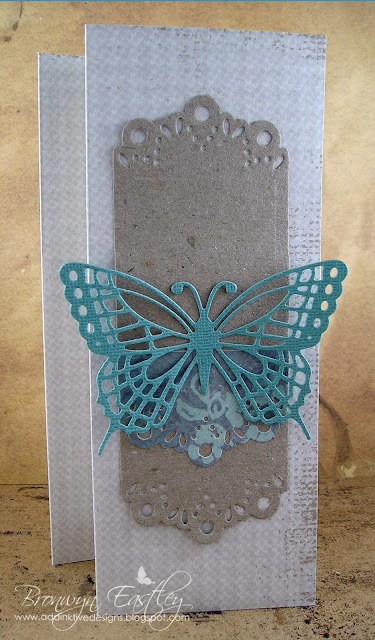 Unfortunately the embossing doesn't show up very well on the dark background. 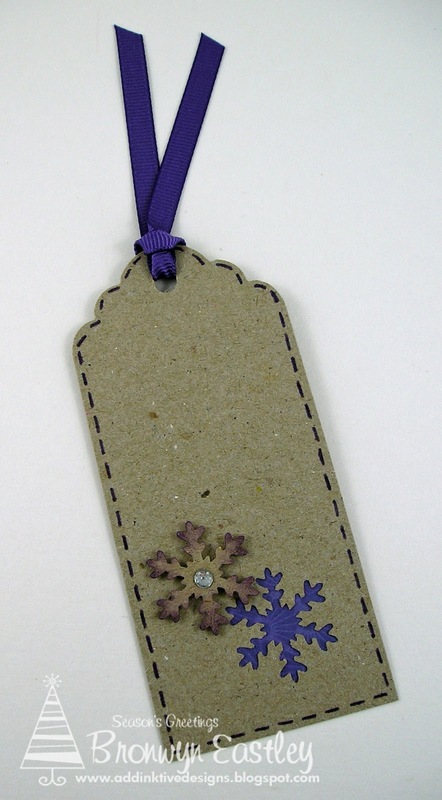 Here's a little Christmas Tag made using a snowflake punch, some faux stitching and a bit of bling. 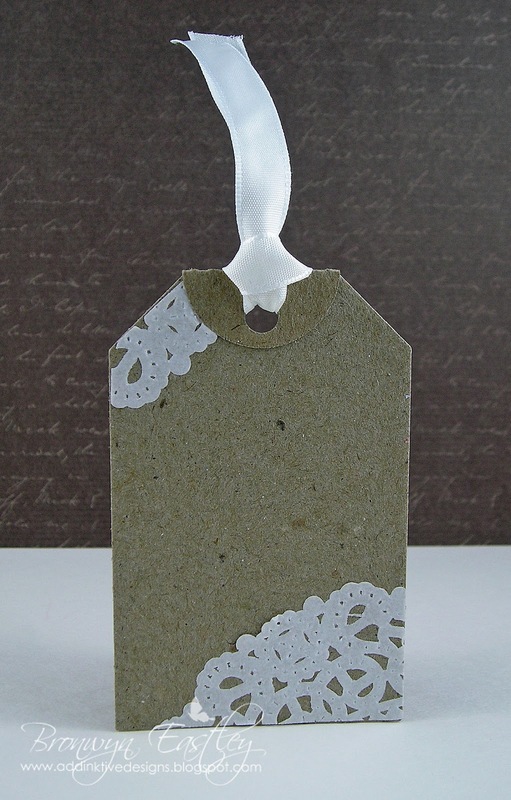 Lastly, don't forget the humble tag can be transformed by simple punching the edge for a decorative effect. Well, that's it for now. It took a fortnight to post all the examples and I feel a bit 'blogged' out! I'll be back later tonight with another tag for the next Monochromatic Challenge at Dynamic Duos. It's Friday and that means another awesome challenge at Just Add Ink. 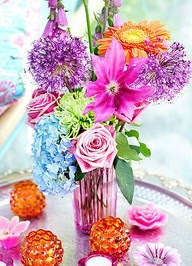 This week we have the following gorgeous inspiration pic for you. 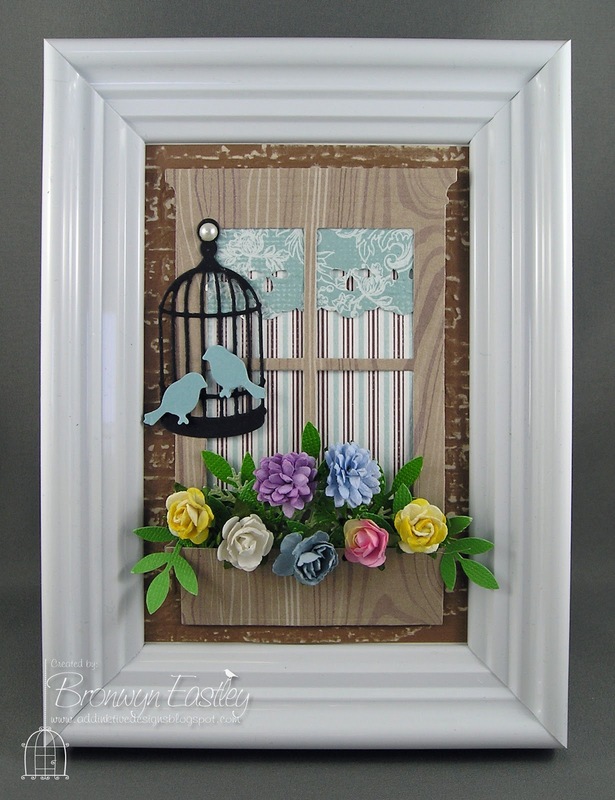 I decided to use a combination of Poppy Stamp Dies and the little birds from a Cottage Cutz die to create a Window Box Scene. 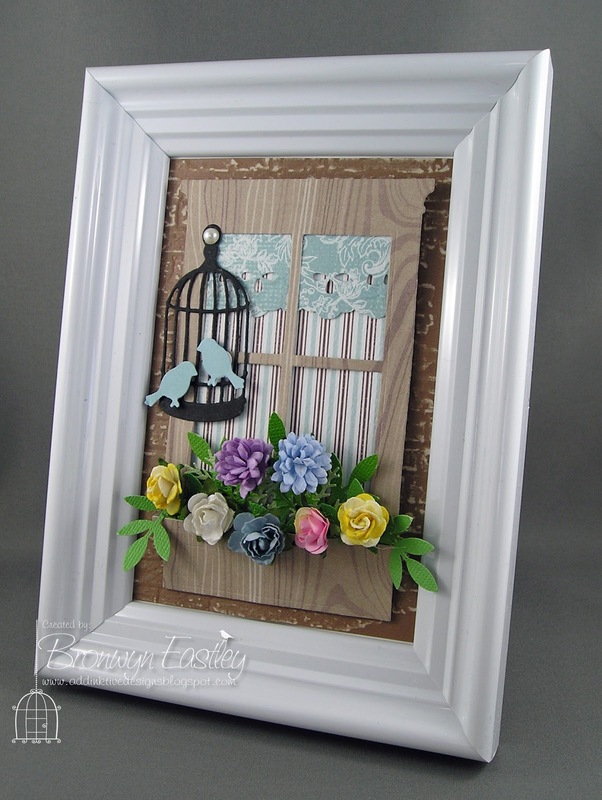 Bizzy Becs have a Flower Power Challenge on for the month of July, so I have decided to combine and enter my project into that challenge too. PS: Thank you Bizzy Becs for selecting this as a Top 3 Pick. 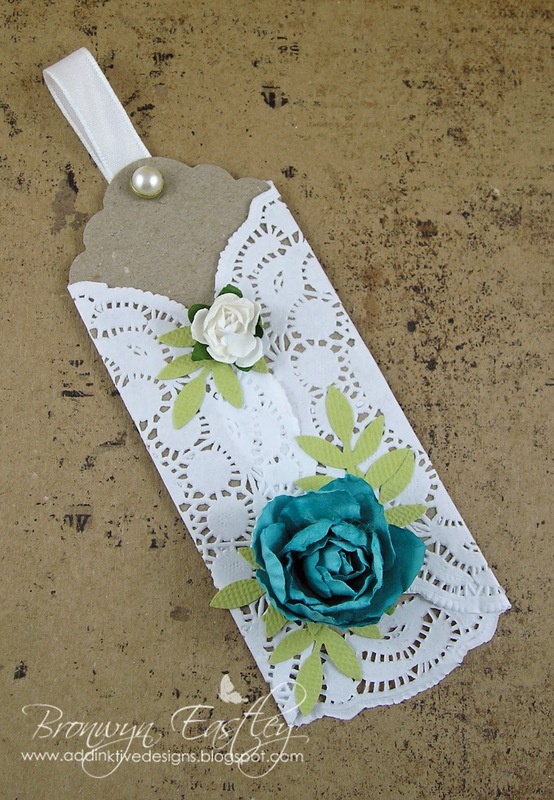 Here's a very quick and easy way to make a tag holder. 1. 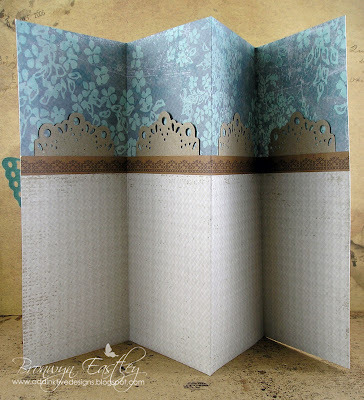 Score your piece of 12x12 patterned paper at 3" intervals (vertically) so you create 4 sections. 2. Score along the horizontal edge at 4" and fold upwards. 3. Run double sided adhesive tape along each edge of every section to form the 4 pockets. 4. Place your tags inside. I used a piece of patterned paper from Kaiser Craft called 'Cosy Cottage' and the beautiful butterfly die from Marianne Creatables for the front of the holder. 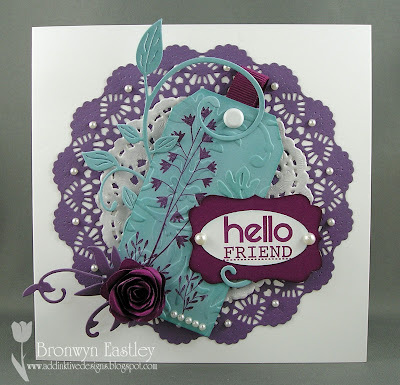 Thanks for stopping by to have a peek at yet another project I did for my recent 'Totally Tags' demo. 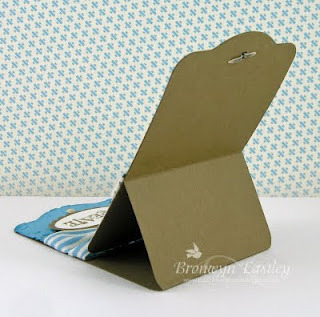 Well, it was inevitable that I would make an easel card for my 'Totally Tags' Demo. 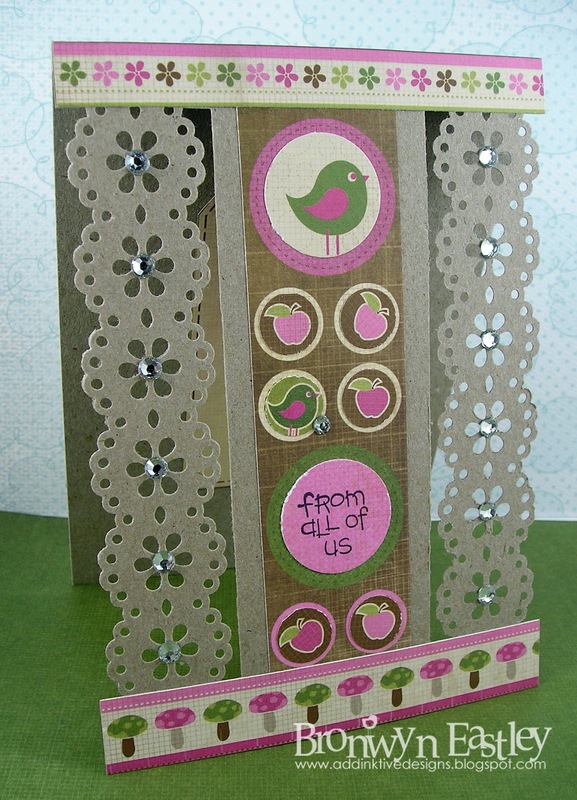 I used a Marianne Creatables tag die to make this card. 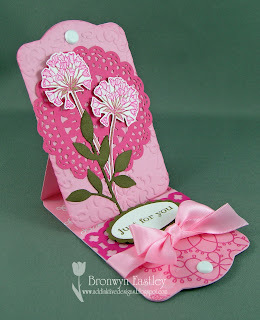 The flower stamp and matching die cuts are from a Hero Arts/Sizzix Set. 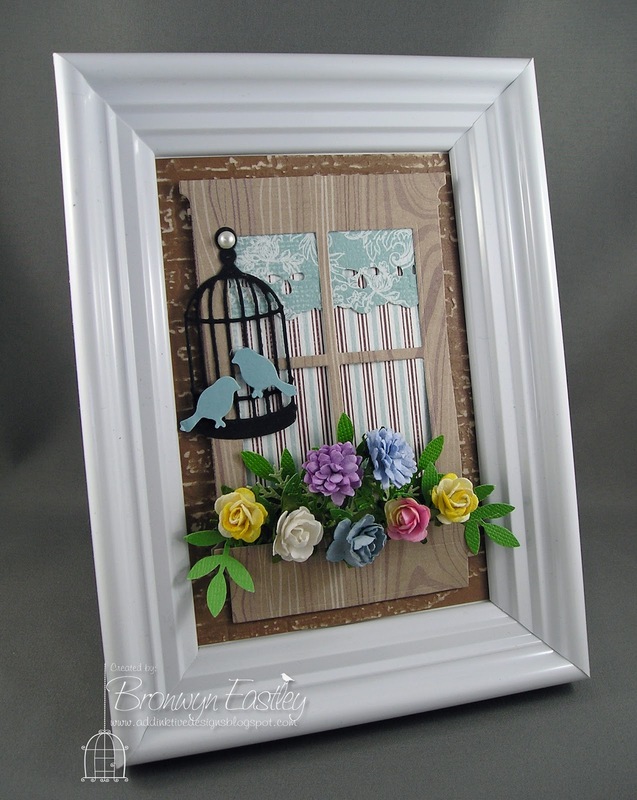 The flower was coloured using Tim Holtz Distress Markers. 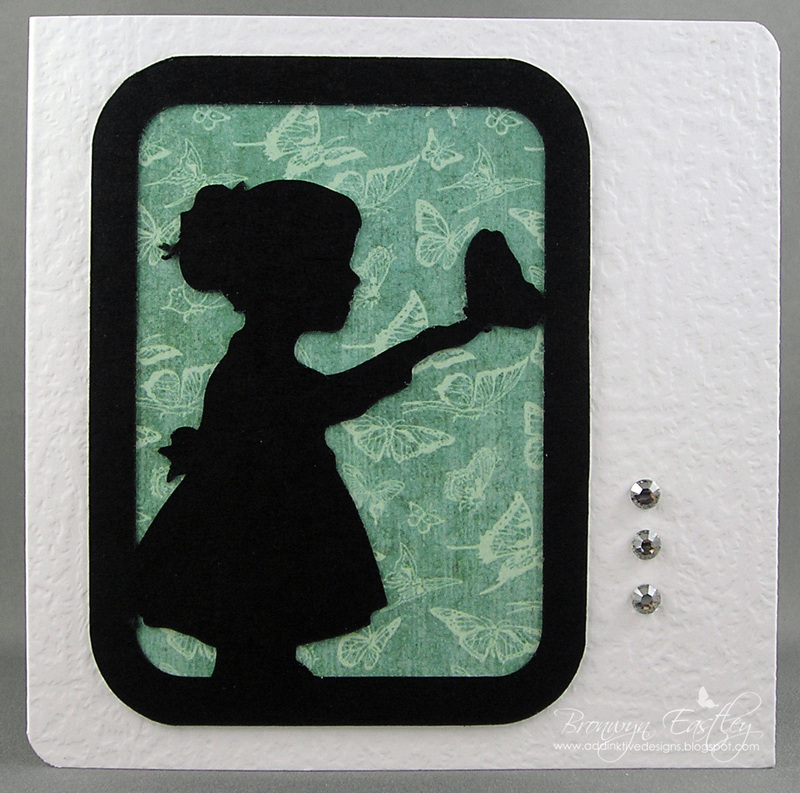 When I was a Stampin' Up! Demonstrator, I had the opportunity to present this idea as a Workshop Wow. 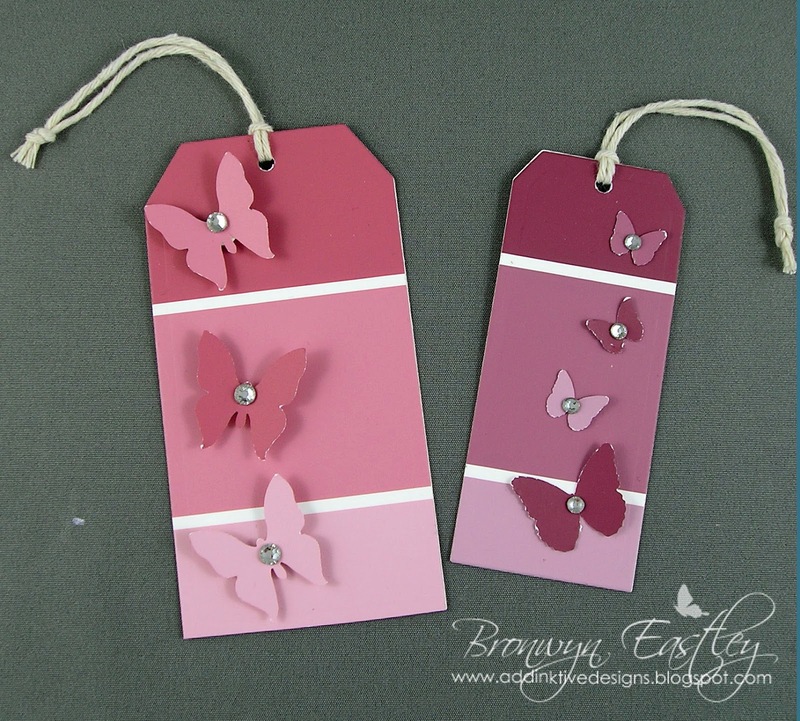 I used the Two Tags Die from SU to create a Tag Easel Card. Here are some that I have made in the past. Click on the photos to take you to the original posts and tutorials. 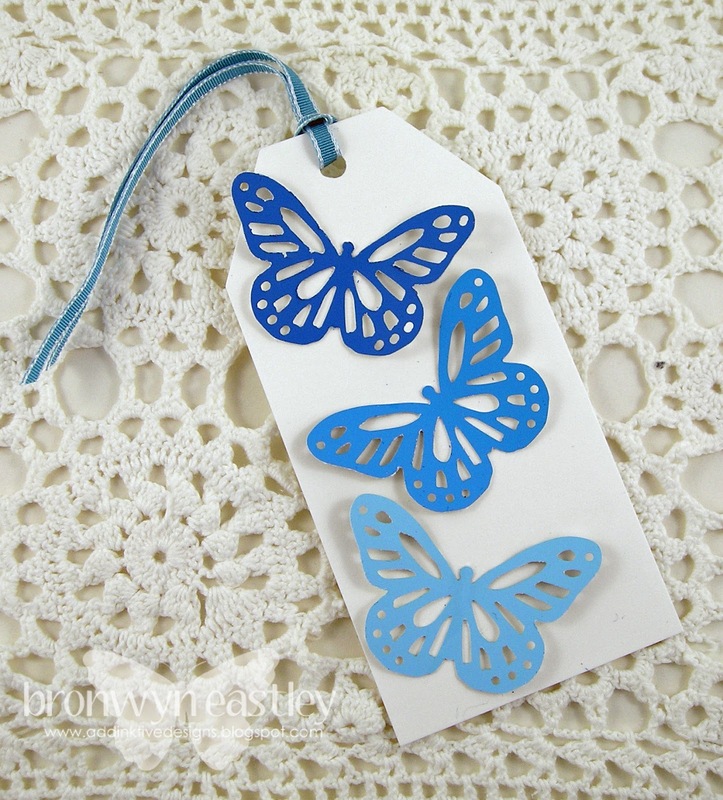 Here are some tags made from various dies. Made from Spellbinders Nestablities Lacey Circles, SU accessories and Martha Stewart Owl Punch. 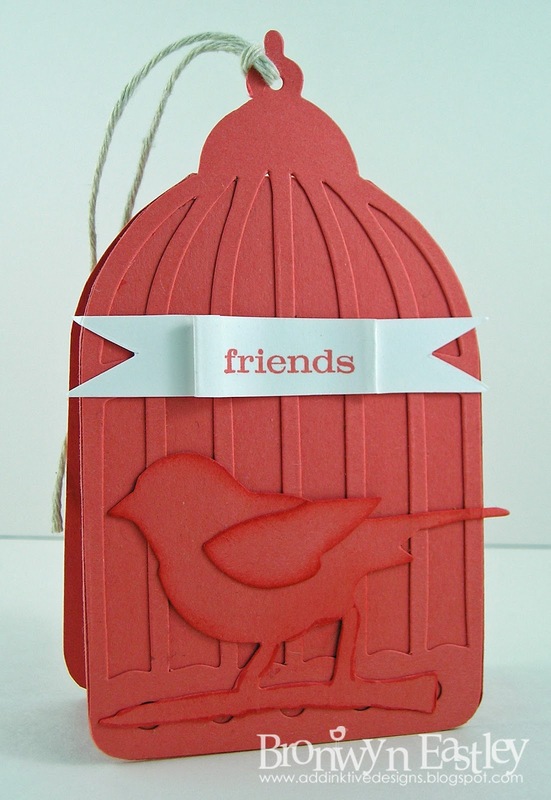 (This idea was taken from a card that Monica Weaver made. You can see it here). 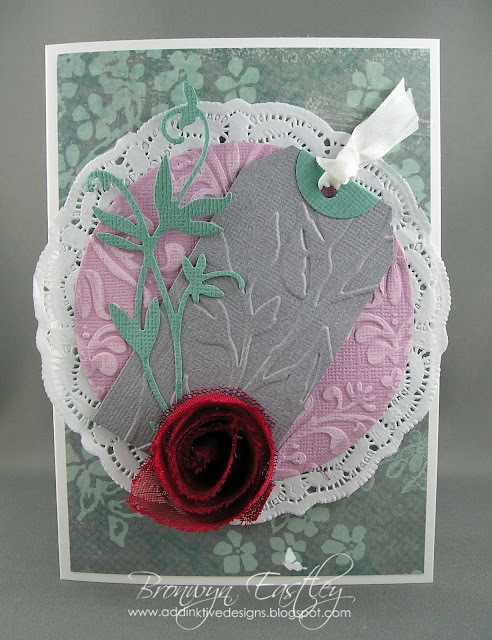 Here's a couple of cards that I shared at my recent 'Totally Tags' Demo. 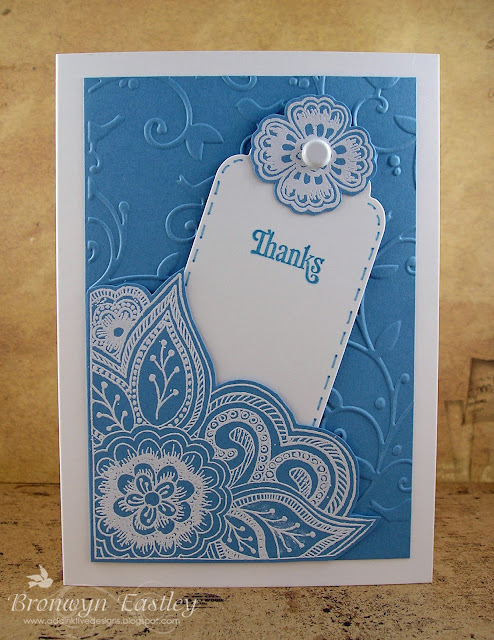 For this card, I heat embossed the beautiful corner stamp from Utopia Collection with white embossing powder, attached it to my dry embossed background, only at the corner edges with double sided tape. I then slid the matching tag inside the pocket that I had created. This second card has a tag on the inside and is made with the Martha Stewart Double Edge Doily Lace Punch and the Kaiser Craft Collection of Hey Birdie Patterned Papers. 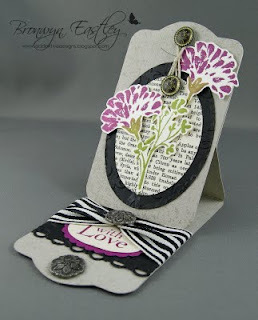 Here's another instalment of projects that I shared at a recent demo entitled, 'Totally Tags'. I won't go into detail about each one as I have a zillion things I need to do today. If you have any questions, please feel free to shoot me an email. This gorgeous card made by my friend, Amanda, inspired the following card that I made for a challenge at Annabelle Stamps. I incorporated a tag for the demo and showed the ladies how to make a paper rose. 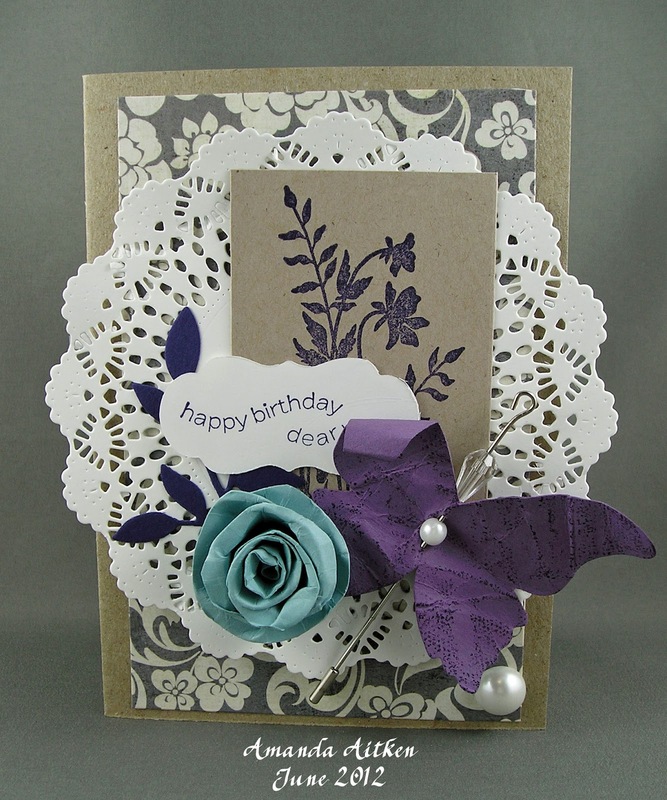 I hope you enjoyed having a peek at my doily inspired tags and cards. There's still a few days worth of posts to go so make sure you visit every day this week. 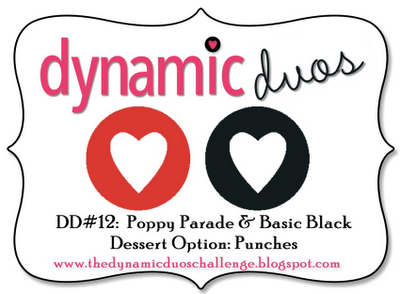 It's Black Tie Week and Poppy Parade is the colour that Lesley has chosen to team up with Black for our 12th challenge at Dynamic Duos this week. The Dessert Option is to use Punches. 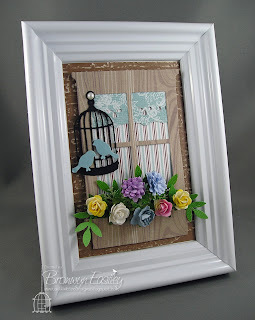 This is another project that I shared at my recent 'Totally Tags' demonstration. 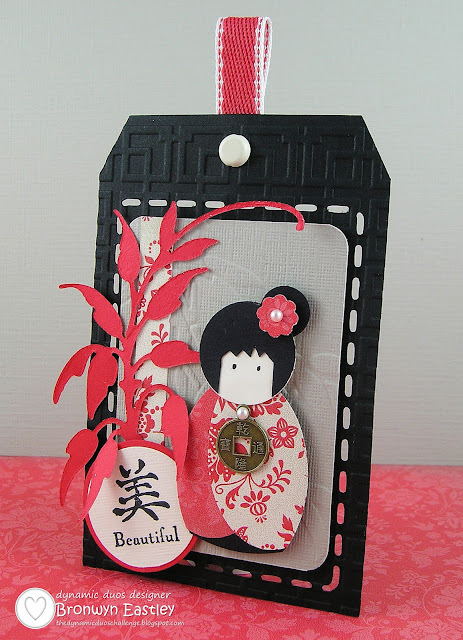 The tag template is from Silhouette (Luggage Tag) and embossed with a CB embossing folder. The colours just led me down the 'Oriental' path so I made a little Japanese Doll from punches. 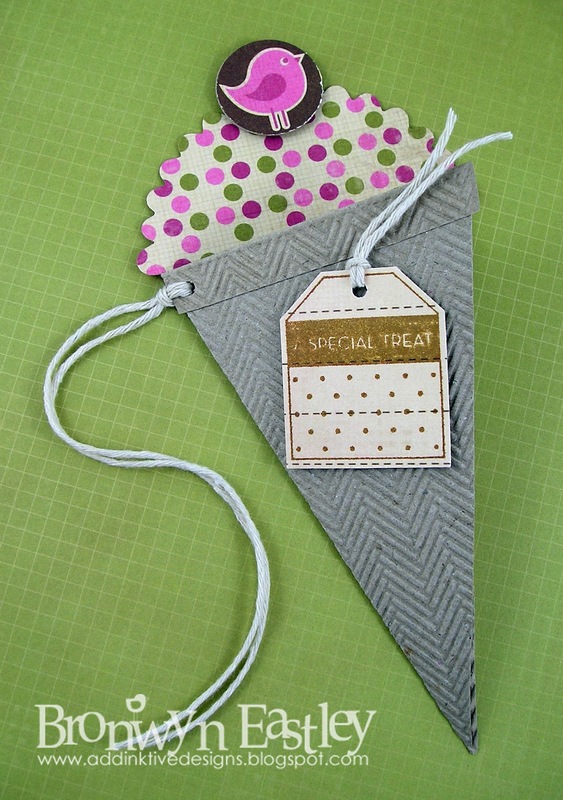 I have made lots of these for swaps in the past and seeing the dessert option for Dynamic Duos is to use punches this week, I thought I would re-visit this cute little design. Here's another instalment from the Totally Tags Demonstration that I did last Monday. I used three different Martha Stewart Butterfly Punches and some paint chip cards to create these cute little tags. 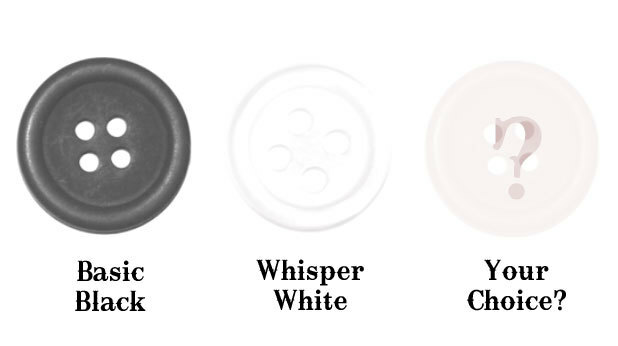 Happy crafting and browsing for colours for your next renovation craft project. I've literally gone bananas over the latest challenge at The Lollipop Ladies. 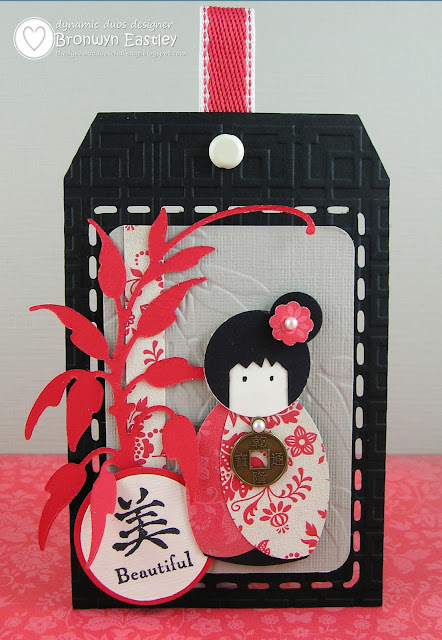 Every fortnight there's some sweet inspiration to get you all inspired to make a paper craft project and join in on the challenge. 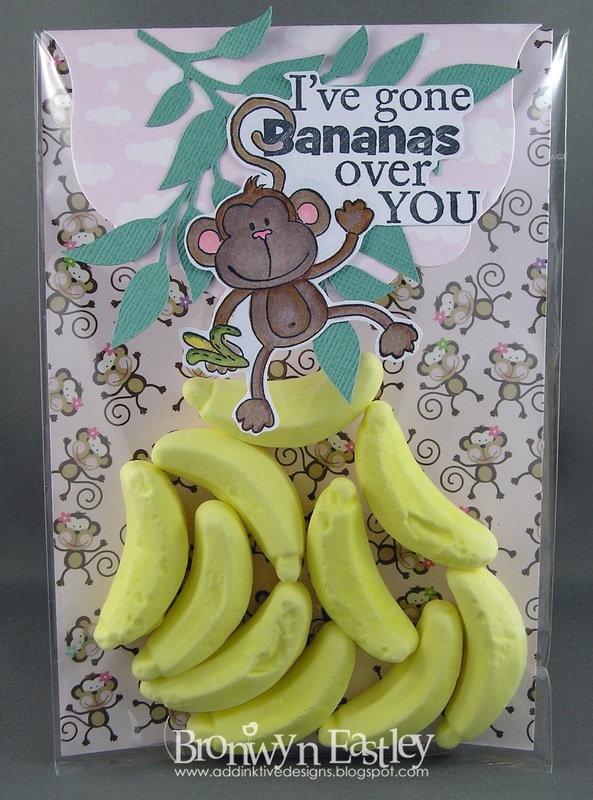 This time around it is all about bananas with the added challenge of leaves. 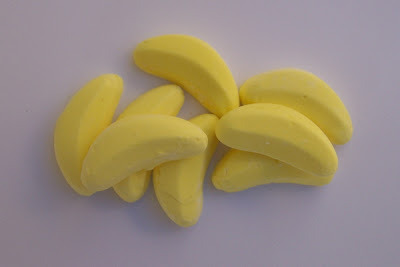 I decided to make a little gift pack filled with banana lollies. The very cute stamp is called, I've Gone Bananas and was coloured with Copic Markers. 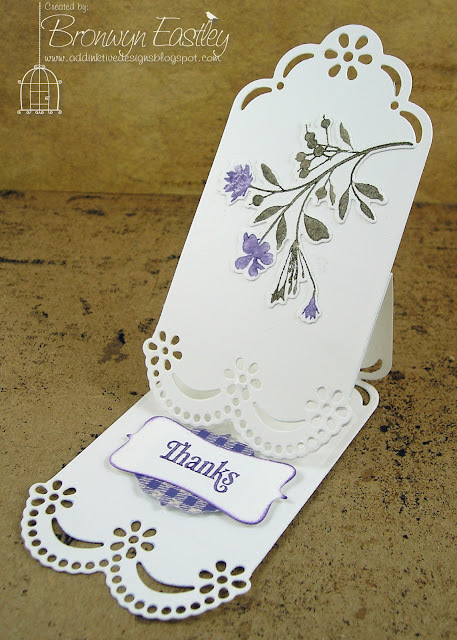 The patterned paper is from Bella BLVD and the leafy die was cut with my Silhouette Cameo. I hope you are able to join in this fortnight. There's always a Guest DT spot and a prize up for grabs. I love a good colour challenge so I decided to join in with the other DT at Just Add Ink on my 'off' week It's a simple colour combo of black and white but you get to choose the third colour option. I chose Sage Green and made a very CAS card. The die cut is from Silhouette. The beautiful sage coloured patterned paper is from the Fairytale Collection (Graphic 45) and the rhinestones are from SU. I hope you can join in with the challenge at JAI. Happy crafting and have a great weekend.